This course is designed to acquaint the student to Gamma instrument and measurements required to detect, monitor, record, and analyze radioactive materials. This will provide quantitative understanding of instrument calibration, surveys and measurements, quality control of data and analyses. The emphasis of this course will be on twenty principles of achieving excellence in gamma spectroscopy. The Radiochemistry Society faculty members that will be teaching this course not only hold PhDs in radiochemistry but also have more than 50 years of combined, hands-on experience with the gamma. 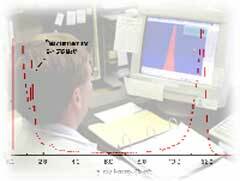 This course will provide both theoretical as well as practical knowledge of the gamma spectroscopy. All personnel needing an understanding of radioactive materials, implementing radiation monitoring programs how radiation is categorized, detected, and measured, people responsible nuclear medicine technologies, radiation safety officers, environmental and waste management, people responsible for homeland security activities as they relate to detection and protection from nuclear materials and weapons. Cost for this course is $1,995.00 [U.S.] with All Proceeds going to the Radiochemistry Society. Space is extremely limited. In order to assure placement we encourage a prompt response. You can register and make payment online via our Secure Cart using Visa, Master Card, Diners Club, Carte Blanche credit cards or by Check or Money Order. The Radiochemistry Society reserves the right to reschedule course dates and/or locations as necessary per enrollment requests.
.:: copyright Radiochemistry.org© - all rights reserved ::.